The law of God in the sanctuary in heaven is the great original, of which the precepts inscribed upon the tables of stone and recorded by Moses in the Pentateuch were an unerring transcript. Those who arrived at an understanding of this important point were thus led to see the sacred, unchanging character of the divine law. They saw, as never before, the force of the Saviour’s words: “Till heaven and earth pass, one jot or one tittle shall in no wise pass from the law.” Matthew 5:18. The law of God, being a revelation of His will, a transcript of His character, must forever endure, “as a faithful witness in heaven.” Not one command has been annulled; not a jot or tittle has been changed. Says the psalmist: “Forever, O Lord, Thy word is settled in heaven.” “All His commandments are sure. They stand fast for ever and ever.” Psalms 119:89; 111:7, 8. Those who had accepted the light concerning the mediation of Christ and the perpetuity of the law of God found that these were the truths presented in Revelation 14. The messages of this chapter constitute a threefold warningi which is to prepare the inhabitants of the earth for the Lord’s second coming. The announcement, “The hour of His judgment is come,” points to the closing work of Christ’s ministration for the salvation of men. It heralds a truth which must be proclaimed until the Saviour’s intercession shall cease and He shall return to the earth to take His people to Himself. The work of judgment which began in 1844 must continue until the cases of all are decided, both of the living and the dead; hence it will extend to the close of human probation. That men may be prepared to stand in the judgment, the message commands them to “fear God, and give glory to Him,” “and worship Him that made heaven, and earth, and the sea, and the fountains of waters.” The result of an acceptance of these messages is given in the word: “Here are they that keep the commandments of God, and the faith of Jesus.” In order to be prepared for the judgment, it is necessary that men should keep the law of God. That law will be the standard of character in the judgment. The apostle Paul declares: “As many as have sinned in the law shall be judged by the law, . . . in the day when God shall judge the secrets of men by Jesus Christ.” And he says that “the doers of the law shall be justified.” Romans 2:12-16. Faith is essential in order to the keeping of the law of God; for “without faith it is impossible to please Him.” And “whatsoever is not of faith is sin.” Hebrews 11:6; Romans 14:23. In Revelation 14, men are called upon to worship the Creator; and the prophecy brings to view a class that, as the result of the threefold message, are keeping the commandments of God. 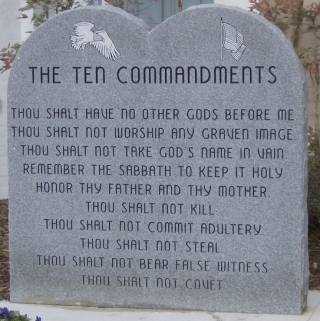 One of these commandments points directly to God as the Creator. The fourth precept declares: “The seventh day is the Sabbath of the Lord thy God: . . . for in six days the Lord made heaven and earth, the sea, and all that in them is, and rested the seventh day: wherefore the Lord blessed the Sabbath day, and hallowed it.” Exodus 20:10, 11. Concerning the Sabbath, the Lord says, further, that it is “a sign, . . . that ye may know that I am the Lord your God.” Ezekiel 20:20. And the reason given is: “For in six days the Lord made heaven and earth, and on the seventh day He rested, and was refreshed.” Exodus 31:17. But the beast with lamblike horns was seen “coming up out of the earth.” Instead of overthrowing other powers to establish itself, the nation thus represented must arise in territory preciously unoccupied and grow up gradually and peacefully. It could not, then, arise among the crowded and struggling nationalities of the Old World—that turbulent sea of “peoples, and multitudes, and nations, and tongues.” It must be sought in the Western Continent. What nation of the New World was in 1798 rising into power, giving promise of strength and greatness, and attracting the attention of the world? The application of the symbol admits of no question. One nation, and only one, meets the specifications of this prophecy; it points unmistakably to the United States of America. Again and again the thought, almost the exact words, of the sacred writer has been unconsciously employed by the orator and the historian in describing the rise and growth of this nation. The beast was seen “coming up out of the earth;” and, according to the translators, the word here rendered “coming up” literally signifies “to grow or spring up as a plant.” And, as we have seen, the nation must arise in territory previously unoccupied. A prominent writer, describing the rise of the United States, speaks of “the mystery of her coming forth from vacancy,” and says: “Like a silent seed we grew into empire.”—G. A. Townsend, The New World Compared With the Old, page 462. A European journal in 1850 spoke of the United States as a wonderful empire, which was “emerging,” and “ amid the silence of the earth daily adding to its power and pride.” —The Dublin Nation . Edward Everett, in an oration on the Pilgrim founders of this nation, said: “Did they look for a retired spot, inoffensive for its obscurity, and safe in its remoteness, where the little church of Leyden might enjoy the freedom of conscience? Behold the mighty regions over which, in peaceful conquest, . . . they have borne the banners of the cross!”—Speech delivered at Plymouth, Massachusetts, Dec. 22, 1824, page 11. Such action would be directly contrary to the principles of this government, to the genius of its free institutions, to the direct and solemn avowals of the Declaration of Independence, and to the Constitution. The founders of the nation wisely sought to guard against the employment of secular power on the part of the church, with its inevitable result— intolerance and persecution. The Constitution provides that “Congress shall make no law respecting an establishment of religion, or prohibiting the free exercise thereof,” and that “no religious test shall ever be required as a qualification to any office of public trust under the United States.” Only in flagrant violation of these safeguards to the nation’s liberty, can any religious observance be enforced by civil authority. But the inconsistency of such action is no greater than is represented in the symbol. It is the beast with lamblike horns—in profession pure, gentle, and harmless—that speaks as a dragon. It was apostasy that led the early church to seek the aid of the civil government, and this prepared the way for the development of the papacy—the beast. Said Paul: “There” shall “come a falling away, . . . and that man of sin be revealed.” 2 Thessalonians 2:3. So apostasy in the church will prepare the way for the image to the beast. The Bible declares that before the coming of the Lord there will exist a state of religious declension similar to that in the first centuries. “In the last days perilous times shall come. For men shall belovers of their own selves, covetous, boasters, proud, blasphemers, disobedient to parents, unthankful, unholy, without natural affection, trucebreakers, false accusers, incontinent, fierce,despisers of those that are good, traitors, heady, high-minded, lovers of pleasures more than lovers of God; having a form of godliness, but denying the power thereof.” 2 Timothy 3:1-5. “Now the Spirit speaketh expressly, that in the latter times some shall depart from the faith, giving heed to seducing spirits, and doctrines of devils.” 1 Timothy 4:1. Satan will work “with all power and signs and lying wonders, and with all deceivableness of unrighteousness.” And all that “received not the love of the truth, that they might be saved,” will be left to accept “strong delusion, that they should believe a lie.” 2 Thessalonians 2:9-11. When this state of ungodliness shall be reached, the same results will follow as in the first centuries. While the worshipers of God will be especially distinguished by their regard for the fourth commandments,—since this is the sign of His creative power and the witness to His claim upon man’s reverence and homage,—the worshipers of the beast will be distinguished by their efforts to tear down the Creator’s memorial, to exalt the institution of Rome. It was in behalf of the Sunday that popery first asserted its arrogant claimsii and its first resort to the power of the state was to compel the observance of Sunday as “the Lord’s day.” But the Bible points to the seventh day, and not to the first, as the Lord’s day. Said Christ: “The Son of man is Lord also of the Sabbath.” The fourth commandment declares: “The seventh day is the Sabbath of the Lord.” And by the prophet Isaiah the Lord designates it: “My holy day.” Mark 2:28; Isaiah 58:13. It is a fact generally admitted by Protestants that the Scriptures give no authority for the change of the Sabbath. This is plainly stated in publications issued by the American Tract Society and the American Sunday School Union. One of these works acknowledges “the complete silence of the New Testament so far as any explicit command for the Sabbath [Sunday, the first day of the week] or definite rules for its observance are concerned.”—George Elliott, The Abiding Sabbath,page 184.
i. A Threefold Message.—Revelation 14:6, 7 foretells the proclamation of the first angel’s message. Then the prophet continues: “There followed another angel, saying, Babylon is fallen, is fallen. . . . And the third angel followed them.” The word here rendered “followed” means “to go along with,” “to follow one,” “go with him.” See Henry George Liddell and Robert Scott, Greek English Lexicon (Oxford: Clarendon Press, 1940), vol. 1, p. 52. It also means “to accompany.” See George Abbott-Smith, A Manual Greek Lexicon of the New Testament (Edinburgh: T. and T. Clark, 1950), page 17. It is the same word that is used in mark 5:24, “Jesus went with him; and much people followed Him, and thronged Him.” It is also used of the redeemed one hundred and forty-four thousand, Revelation 14:4, where it is said, “These are they which follow the Lamb whithersoever He goeth.” In both these places it is evident that the idea intended to be conveyed is that of “going together,” “in company with.” So in 1 Corinthians 10:4, where we read of the children of Israel that “they drank of that spiritual Rock that followed them,” the word “followed” is translated from the same Greek word, and the margin has it, “went with them.” From this we learn that the idea in Revelation 14:8, 9 is not simply that the second and third angels followed the first in point of time, but that they went with him. The three messages are but one threefold message. They are three only in the order of their rise. But having risen, they go on together and are inseparable. ii. Supremacy of the Bishops of Rome.—For the leading circumstances in the assumption of supremacy by the bishops of Rome, see Robert Francis Cardinal Bellarmine, Power of the Popes in Temporal Affairs (there is an English translation in the Library of Congress, Washington, D. C.); Henry Edward Cardinal Manning, The Temporal Power of the Vicar of Jesus Christ (London: Burns and Lambert, 2d ed., 1862); and James Cardinal Gibbons, Faith of Our Fathers (Baltimore: John Murphy Co., 110th ed., 1917), chs. 5, 9, 10, 12. For Protestant authors see Trevor Gervase Jalland, The Church and the Papacy (London: Society for Promoting Christian Knowledge, 1944, a Bampton Lecture); and Richard Frederick Littledale, Petrine Claims (London: Society for Promoting Christian Knowledge, 1899). For sources of the early centuries of the Petrine theory, see James T. Shotwell and Louise Ropes Loomis, The See of Peter (New York: Columbia University Press, 1927). For the false “Donation of Constantine” see Christopher B. Coleman, The Treatise of Lorenzo Valla on the Donation of Constantine (New York, 1914), which gives the full Latin text and translation, and a complete criticism of the document and its thesis.